Here at Codec Moments we like to think that we can answer any questions thrown at us, and if we don’t actually know, we’ll do our best to try and cobble a semi-coherent answer together. We might even do this at times when we’re not directly asked. This is one of those times. 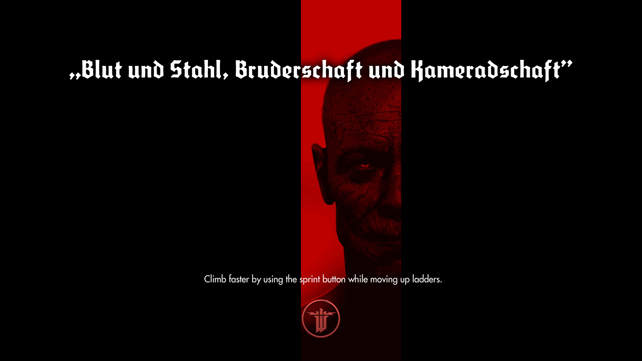 Ever since our Wolfenstein: The New Order review went live, our most frequent search terms have thrown up the question about what the loading screen messages mean, and we’ll admit to being curious as well. In a scientific approach our own Prof. Harris would be ashamed to be associated with, we’ve grabbed as many screens as we could find with different phrases and run them through Google translate, saving your fingers the hassle of pressing buttons/touchscreens, which frees up them up for continuing the liberation of an alternate 1960’s universe. Blood, bone and flesh – as iron *thanks for the correction of meat to flesh Darren! If you find one we’ve missed, because we can be a bit slap-dash when it comes to repetitively loading levels to find out if there’s a new phrase going to pop up, then Email/Tweet/G+/Facebook/Comment and we’ll add it in with the appropriate credit to the finder. 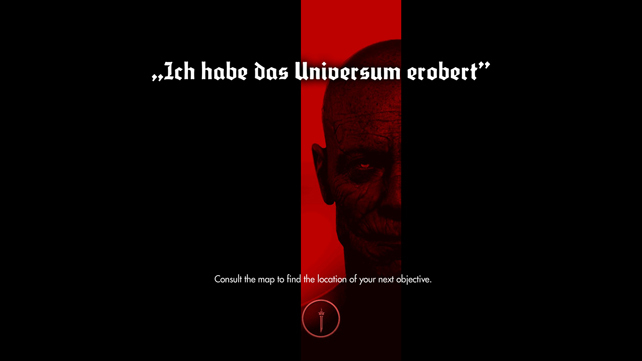 Likewise, if you’re a native German speaker and find that our translations are terrible and insulting, hit us up and we’ll get them fixed (after blaming the service that gave us the answers, of course). Brilliant, thanks for the confirmation J! Starkes Herz, Starker Stahl — means Strong Heart, Stronger Steel. 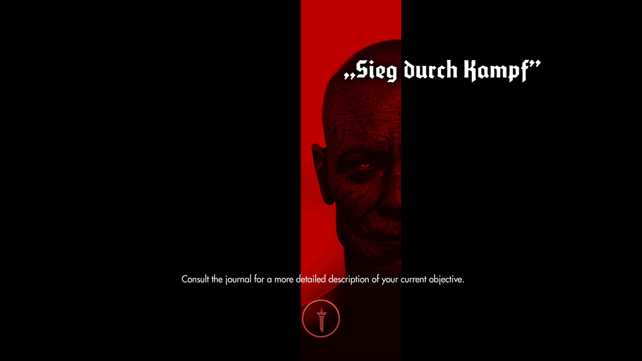 Starke durch Wissenschaft– Starke means Strength, not Strong. It is the substantive form of the adj. Much appreciated Hank! They make more sense now too. The first example is not correct. “Starker Stahl” is no comparativ. It means simply “strong steel”. I agree with the other examples. Any chance of getting some screenshots of the posters etc. and those translated (off the walls) ? There are some pretty cool looking signs (e.g. Strom = Electricity, with various warnings about it, “Enlist now” with a picture of a soldier, “The Western Border is secured”). Overall, the atmosphere of the game is pretty good and they certainly add to it. Hey r3ap3r, thanks for those! Much appreciated r3ap3r! We hit a point where they kept repeating, but we’ll keep adding new ones to the list! 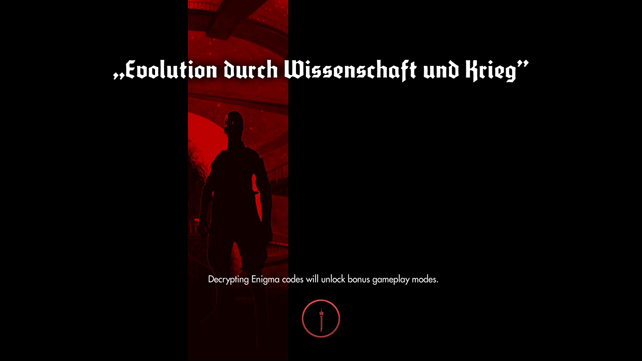 I found the loading screen phrase “die stärke des stahls in unseren herzen” during a loading screen when you break either Fergus or Wyatt out of prison near the game’s start. “Die Stärke des Stahls in unseren Herzen” bedeutet/means “the strength of steel within our hearts”. A slight correction to “Ich bin wie die sonne – ein blendende macht” I am like the sun – a blinding power. 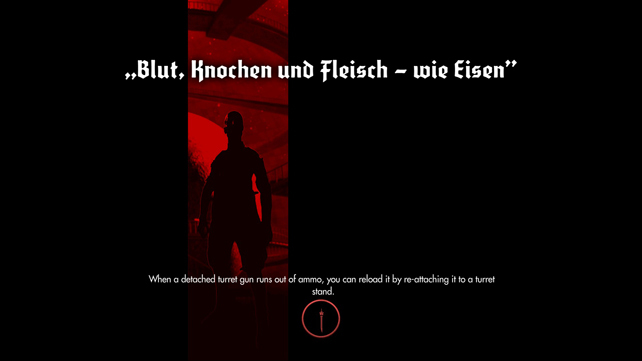 Loved this part of the game (and my German other half found it amusing there were no translations). Thanks Fury, the context and meanings of the phrases are tricky to get right so any help is great. And if your other half sees anything more then drop us a line! “Macht” in that context gets dircetly translated to “Force”, because it’s a comparison from him to the sun, not his power vs that of the sun. Its impossible for a non-german speaker to see the mistake – practically its not a mistake, but “Richtschnur” in that case serves a rather burtal meaning, as “Richtschnur” can mean guideline, but in that case it is referring to the rope on which some is hanged (“richten” in german can be used as a form of “hinrichten”, its a little old-fashioned but grammatically correct), so it should be noted, as the word “richtschnur” in german can mean both – its a play with the double-meaning used to intensify Deathshead “Do or die”-principle. Rest is very well translated, im a german native speaker, so trust me with these. Hey Thorus, thanks for the input! It’s great having people who speak the language let us know where we’re slightly out. Google Translate is good, but not that good! I just stumbled upon this site and I have got a few things i want to add. 1) ‘Strong heart, stronger steel’ is not the correct translation. “to struggle with something” implicates that you have or had problems to achieve something. are more better options since Nazis don´t negotiate; Nazis prefered to fight, kill or die over negotiating. Do you see the strings forming a straight line? Those strings are “Richtschnüre” (pl. )/ “Richtschnur” . Its a tool we use to build something ( for example) streets / walls / buildings in a exact straight line . (“…thy will be done…” ) is the idea behind that slogan . it must be done exactly that way, whatever it may be. —->>> “my will is your [insert name of the tool / (Richtschnur)]. This should be Blood, Bone and Flesh – As Iron…not Blood, Bone and Meat – As Iron. 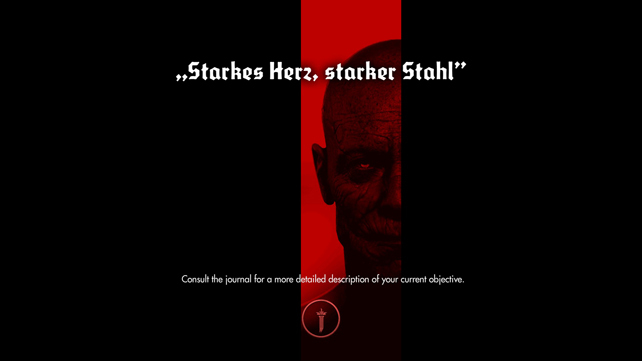 “Starkes Herz, Starker Stahl” means “Strong Heart, Strong Steel” (not “stronger steel”). The -er ending on “stark” is the masculine adjective ending, which can be easy to confuse with the comparative form. 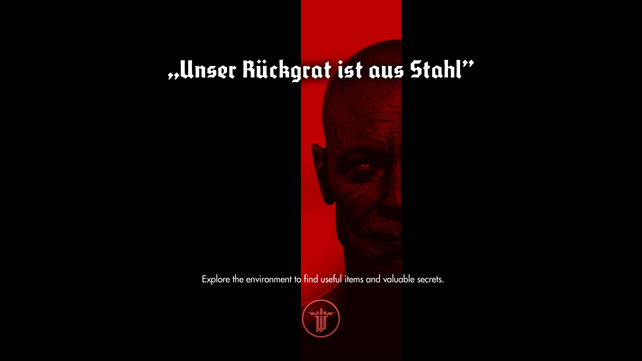 To say “stronger steel” you would say “”Stärkerer Stahl” which involves adding an umlaut to the adjective, and two -er endings, the first for the comparative and the second for the masculine gender of the noun. Thanks for the pics! 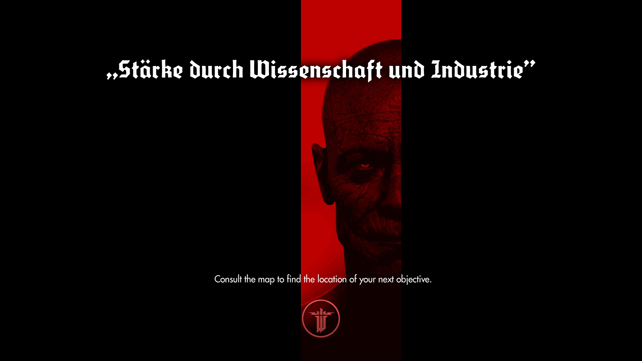 May I ask you to include a neat, not moving, not downsized pic (I mean, as good looking as the ones you already uploaded) of this variation of the „Stärke durch Wissenschaft und Industrie” screen? It does beg the question… why? If one pops up the next time we’re playing we’ll screengrab and let you know (might be some time though! ).